Supernatural Thriller Features Art Therapist!! 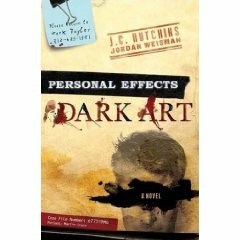 I am excited and intrigued to see that a new book, Personal Effects: Dark Art , has been published, written by J. C. Hutchins and Jordan Weisman that includes an art therapist as a leading character. I have not had a chance to read it yet- I have a copy on order- but, as an art therapist myself, I am excited to see this and wanted to get the word out to you all. If you read it, let me know what you think. I read about halfway through this book and, alas, I could not sustain my interest. I’m not sure if it was because of the way it is written, the story line, the character development, or something else. I wanted to like this book. Too bad. If you’ve read it, let me know what you think in the comments. When the shoebox is full, which should be about 100 poems, and should take at least three months, you may now read. On a day when you are calm.